I swear… as soon as we wind our clocks forward and tack that extra hour of daylight to our evenings, I’m sure it’s summer. I’m sure it’s time for a new pair of (now age appropriate) jean shorts, time for pink wine and pink sunsets, time for me to start chasing the sound of summer waves crashing on summer beaches. Time, really… for me to hold my horses. Because spring. Because there’s this easing into summer that usually involves lots of spring rain and surprisingly crisp days and just blooming flowers. In these gloriously crisp and blooming days we get welcome early strawberries and right-on-time rhubarb. It’s only natural that we combine the two in some sort of pie iteration. Today: cobbler with cornmeal biscuits and soft honey cream. We’ve done spring time biscuit things before. See: Lavender Blackberry Scones. Mish mash. Splish splash. Humble crumble. Strawberry rhubard. Honeyed cream supreme. Flour and cornmeal. Buttermilk and butter. Sugar and salt and leavening. For biscuits. Strawberry and rhubarb. Orange and fresh nutmeg. Sugar and cornstarch. For fruit filling. I start by mixing the sliced fresh strawberries with the sliced fresh rhubarb. Sneak a few bites of the raw rhubarb in your mouth just to appreciate how tart it is. Very tart. Just one of those things to let you know what the world tastes like before we sweeten it with sugar and bake it up. To the fruit and barb we’ll add granulated sugar, cornstarch to thicken the juices, orange zest, orange juice (just a good squeeze), and freshly grated nutmeg for a grounding spice. The mixture is tossed until each bit of fruit is coated in sugar, cornstarch, orange and nutmeg. The sugar and cornstarch will disappear into the fruit. In a 9-inch baking pan the mixture will begin to seep juices. That’s good news all the way. While the fruit macerates, we’ll make the cornmeal biscuits. We’ve been down this biscuit road before. This go-round we’re adding cornmeal for that bit of texture that makes your mouth-brain say heeey! We’ve also got the usual suspects: all-purpose flour, a good sprinkle of sugar and salt, baking powder and baking soda. You may need to reroll the scraps to get 9 biscuits. One reroll is totally called for. The biscuits are brushed with melted butter and sprinkled and sugar (for extra credit). This cobbler gets two bakes. The first bake softens the strawberries and rhubarb. The second bake fluffs and browns the biscuits and makes the bake extra juicy. 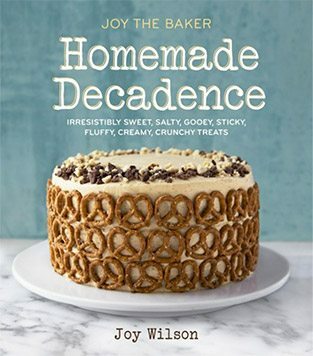 With honeyed cream, aggressively honeyed cream, this bake is irresistible. I like mine smushed and mushed to an almost unrecognizable biscuit, fruit and cream mixture. 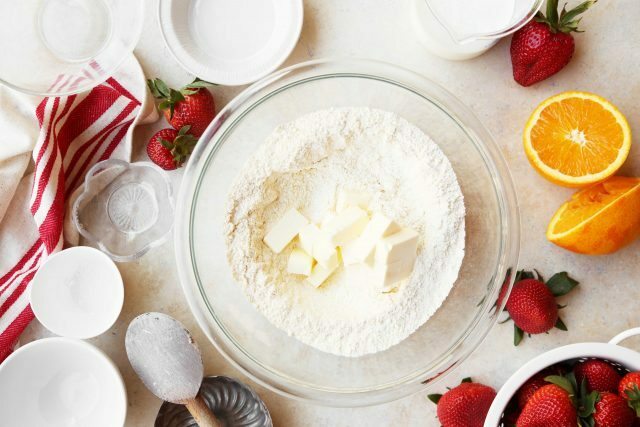 To make the biscuits, in a medium bowl whisk together flour, cornmeal, baking powder, baking soda, salt, and sugar. Add 7 tablespoons of the cold butter chunks to the dry ingredients and use your fingers or a pastry cutter to work the butter into the flour mixture. Work the butter into the mixture until some butter is the size of oat flakes, some the size of small peas, and all of the dry ingredients are lightly coated in fat. Create a small well in the center of the mixture and add the buttermilk. Use a fork to fluff the mixture together, being sure to moisten every bit with buttermilk. Add a tablespoon or two more if your mixture is feeling too dry. Stir the mixture into a shaggy dough then dump onto a lightly floured work surface. Gently work the dough into a 2-inch thick disk. Use a lightly floured rolling pin to roll the dough to a 1-inch thickness. Use a 2 ½ inch round biscuit cutter to cut biscuit rounds, gathering and rerolling the scraps to cut 9 biscuits. Set aside. 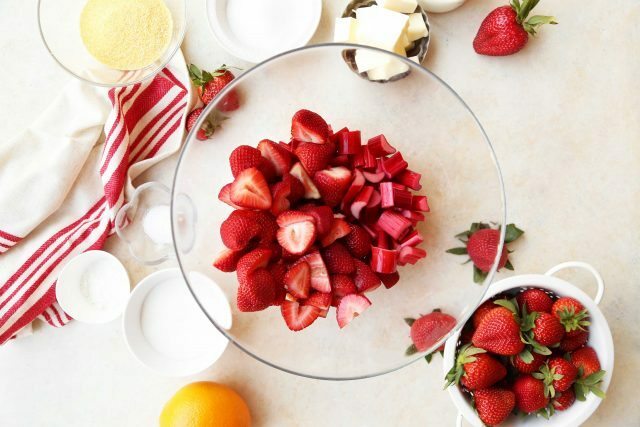 In a 9-inch square pan, toss together rhubarb and strawberry pieces, sugar, cornstarch, salt, nutmeg, orange zest and orange juice. Toss until everything is evenly coated. Bake fruit mixture for 20 minutes, until just beginning to bubble. Remove from the oven and place the biscuits on top of the warmed fruit. Brush the top of the biscuits with the remaining tablespoon of butter that has been melted. Return the biscuits and fruit to the oven and bake for 15 minutes, until the fruit has broken down and bubbled, and the biscuits are risen and golden. While the biscuits bake, combine cream, honey, vanilla, and salt in a medium bowl. Beat with an electric hand mixer until the cream reaches soft peaks. Remove the cobbler from the oven, allow to cool for 20 to 30 minutes before serving so it’s just warm when dishing into bowls. Serve with honeyed cream and enjoy! 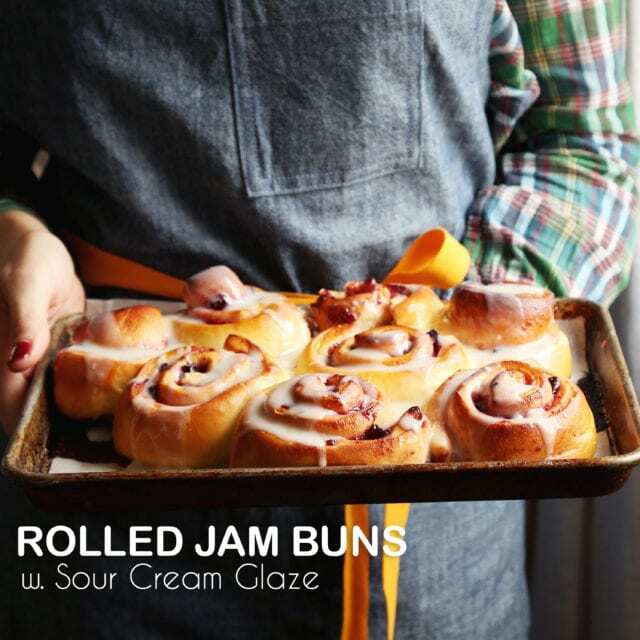 I really want to make these when I get back from school! The age appropriate jean shorts struggle is REAL. I’m still on the hunt! Do you have any favorites in particular? I’m definitely making these. And thanks for the template- very thoughtful! Irresistible indeed! And oh so pretty. Perfect for spring!! I am the same way – bring on summertime, it is my very favorite!! 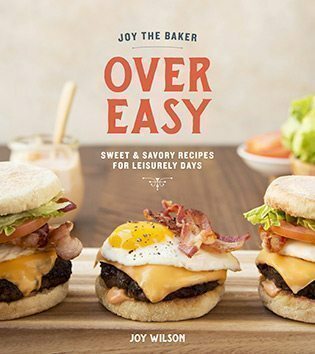 Your RSS feed is http://joythebaker.com/feed/ right? My RSS reader is saying it has problems. This is on my list to bake this summer. 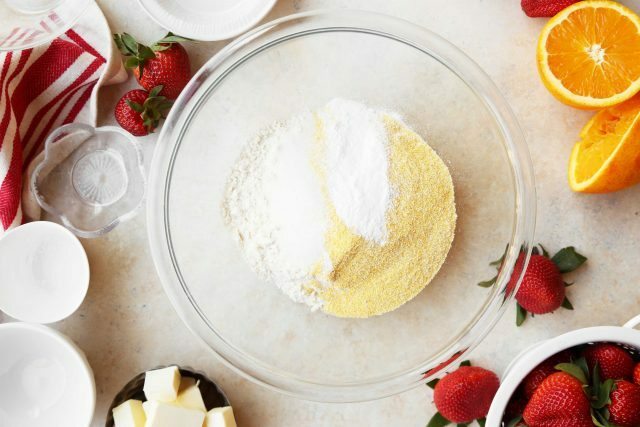 I am a huge strawberry shortcake fan so finding another take on this dessert puts a big smile on my face. And a happy belly! Where did you find rhubarb in NOLA? I never have much luck finding it here. “Aggressively honeyed” feels like should be my new Twitter bio. My rhubarb is just starting to peek out of the ground up here in Minnesota. This recipe will be perfect! Thank you, Joy! Why does everything move so fast now and days?!?! But you have definitely inspired me to unleash the inner baker in me! Can’t wait to try this! YAAASSS! I want this now, which is weird because it’s 8:15 AM and I’m sitting in my cubicle (not working?). The only thing – do you think the balance would still be right with lemon instead of orange? I love orange, juuuuust not in my cobblers. It’s weird. It’s my thing. It’s my weird thing. –Thanks Joy!! I wanna be eating this now. Omg, thanks for such a great recipe, Joy. You da bestest!!! This is gorgeous, yet looks fairly easy. The amounts of sugar seems pretty reasonable for a dessert, but do you think they can be squeezed even more? I cut out sugar for over a month and liked how much energy I had. But I cracked and had some (pancakes with maple syrup) for the first time a few days ago and felt downright sick afterwards. I kind of want to have my cake (or other desserts) and to eat it too (without feeling a sugar hit).